Sorry for the late response, The past month has been a blur. Mel and I want to thank everyone who came and marched with us at the Walk To Defeat ALS, and all those who supported our walkers. 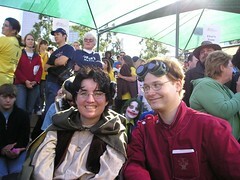 "Cuppa Joe" (l) and Melissa and I as Frodo and Dr. Horrible, respectively. 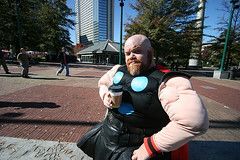 It was a beautiful day in Centennial Olympic Park. Started off a bit cold, but warmed up nicely just after the walk started. Many teams had great showings of dozens of people in their team shirts, but (just as Melissa wanted) we did our own thing and drew a lot of attention with our costumes. Many of the organizers loved the idea so much they couldn't stop talking about it. 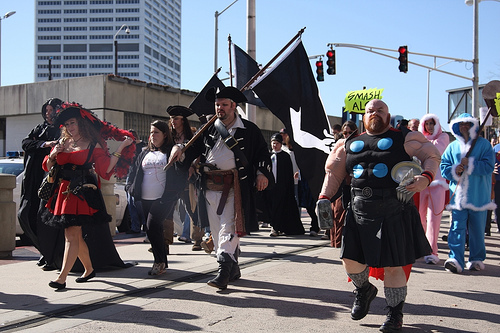 They especially loved the Pirate Flags flying through the streets of Atlanta. Look at this shot... Can't you see us walking in slow motion with some hard rock song in the background? 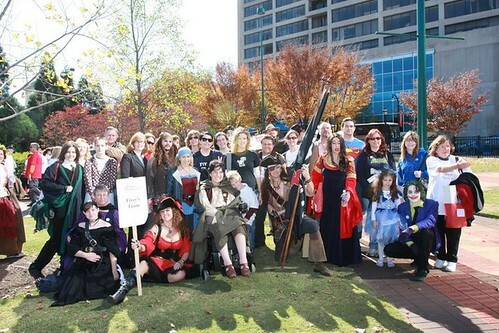 Final Tally for Fiver's Team : $15,343.00 Raised = 3rd Place in Georgia! This is such an incredible result. Our original goal was $2000, figuring that we used about that much in services from the ALS Association this year, so we'd be Karmically Even. But then we raised that much money very quickly, so we doubled it. Again, we met our goal and we doubled it again. Every time we raised our goal, we just kept getting more money in, like some charitable Perpetual Donation machine. This just blows us away. There has been so much good that has been done for Melissa this year by you people, and now for ALS suffers and their families, I just don't know how to express it anymore. Project Fiver has been so successful at it's endeavors so far that I find myself looking for more good that we can do together. Let us ponder what new ideas we can come up with over the holiday and We'll see you all in 2009! Merry Christmas from Project Fiver!